Southmoreland on the Plaza Bed and Breakfast - an Urban Inn sets a new standard for Bed and Breakfast hospitality and comfort. Optimal location for Kansas City Tourism! 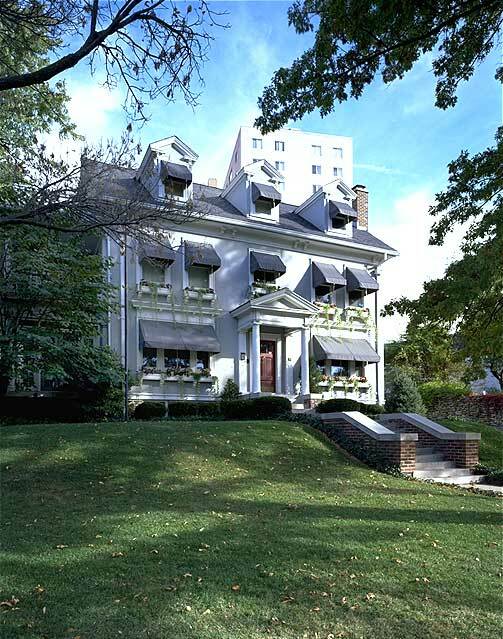 Located just two blocks off Kansas City's famous Country Club Plaza, the Inn blends classic New England Bed and Breakfast ambiance with small hotel amenities. Twelve guest rooms in the main Inn and a luxury suite in the Carriage House offer private baths, telephones and parking. Each room has a special feature such as treetop deck, fireplace or Jacuzzi. A stay at Southmoreland on the Plaza Bed and Breakfast includes a gourmet breakfast in the morning, complimentary wine and hors d'oeuvres in the late afternoon, and an evening hot beverage service and sweets. Guests also have privileges at two nearby fitness centers. Also offering corporate rates. Southmoreland on the Plaza Bed and Breakfast in Missouri is an Inn of national reputation and your choice in luxury accommodations when visiting Kansas City. Call today for reservations and start enjoying your Missouri vacation immediately! Website hosting and promotion by Acorn Internet Services, Inc.